If you ever come across a violin made by Channon of Devonport you can be sure it is a fine instrument, and recognised as such by both musicians and the antique market, for Channon is recorded as one of the best and most esteemed of British violin makers of his day. Image of Channon at his work in Devonport, from the book British Violin Makers... 1920. The signature is probably a facsimile of his own. The business of cabinet-making has a special interest for the writer on the industries of a certain district, and we may safely say that, in the town of Devonport Mr. F. Channon takes a leading position in the cabinet trade, and it gives us pleasure to make special mention of his work in these pages, as his business is not only important but, we unhesitatingly assert, unique of its kind in the three towns. We refer especially to that part of the business which is devoted to the peculiar, interesting, and intricate art of violin-making. Cabinet making. Brought up by the celebrated firm Dart’s, of Totnes, and having acted for three years as foreman at Messrs Graves & Sons, of Devonport, Mr Channon in 1886, established the above works, and has creditably identified his name with high-class work in art cabinet-making. American walnut richly inlaid is one of his specialities, admirable alike for beauty of material, accurate construction, and delicate and faultless finish. Mr Channon is an artist as well as an artisan, and his designs are on a par with his workmanship, all being characterized by superior elegance and taste. His practical qualifications are of a high order, and he is well known throughout the county as a technical instructor, teaching every department of the woodworker’s art with thoroughness and skill. He has obtained certificates of merit, first-class bronze and silver medals from the Royal Polytechnic and other exhibitions, to which testimony no words of ours can add. We strongly recommend a visit to his newly built and commodious works. Upholstery. Upholstery is, of course, a branch in which Mr Channon is experienced. All materials used are of the best; hair perfectly new and clean; springs of the most approved shape and size; coverings are the best that can be supplied. French Polishing. By using only the purest gums in the making of his polishes, he is able to insure its transparency and durability. Furniture Reviver. After years of research, Mr. Channon discovered his celebrated Instantaneous Furniture Reviver, which produces an effect in application that entitles it to be termed the best reviver in the market, and has received awards wherever exhibited. Violin Making. Mr. Channon has achieved great success in violin-making, and he considers this branch of his work a speciality. His extraordinary success with his first violin, bow and fittings – made under the direction of Mr F. Codd of Devonport, certified by him as of excellent tone and purity, and awarded a silver medal at the 1893 Royal Polytechnic – induced him to establish a thoroughly equipped workshop. Here we find several instruments in course of construction, together with some valuable old ones entrusted to Mr. Channon’s skillful hands for repairs, for which he is largely patronized by the leading professionals in both counties. Here also are models from the great makers, and a large stock of well-seasoned and selected woods. Not only is he capable of repairing the most valuable and delicate instruments, but he has, after many experiments, obtained an oily varnish which gives the greatest possible satisfaction, and may in after years prove famous. His resin is purer than that obtained in the usual way. Strings and all necessary fittings, in fact, a complete violinist’s outfit, can be supplied. Mr Channon conducts his business with conspicuous ability and enterprise, and has the confidence and support of an influential and growing connection in this part of the country. page 20/21... Since about the year 1850 the British School of Violin-making may truly be said to have accomplished the most complete of its avatara, or incarnations: it has been born again - born, I verily believe, to a higher and fuller manifestation of life. We have now working amongst us Atkinson, Byrom, Channon, Chanot, Darbey, Gilbert, Hesketh, Keenan, Owen, Richardson, Withers, etc., much of whose work will, I venture to think, be highly esteemed a century hence. page 22... Atkinson Channon, Gilbert and one or two others among professional makers, mostly work on models of their own. page 31... A very beautiful varnish is produced by Mr. F.W. Channon, a clever and well-known professional violin maker, of London. Unlike the majority of professional makes he does not attempt to make a mystery of its composition or of the method of its preparation; on the other hand, he readily reveals both. With his kind permission I am allowed to say here that he is prepared to furnish his formulae with full instructions to any bone fide violin maker. page 118... CHANNON, FREDERICK WILLIAM, London. He works at present at 54 wells Street, Oxford Street, as a professional maker and repairer, but up to about two years ago he lived in Plymouth, where he had been established for many years as a professional maker. He was born at totnes, in 1862, and apprenticed in early life as a cabinet maker. He made such rapid progress at his trade that at the age of twenty-one he became forman of one of the largest cabinet shops in Devonport, with about thirty men and apprentices under his charge. At the age of twenty five he commenced business on his own account, and he was appointed at the same time technical instructor in carving and carpentry to a local institution. He commenced to make violins in 1887, first as a hobby and during spare time in a year or two he resolved to give up all other work and devote the whole of his time and energy to the art of constructing and repairing violins. That he decided wisely is abundantly proved by the very beautiful work he now produces. He is in the foremost rank of present day makers, and it is a pity that so much of his time is taken up with repairs. Repairing is, of course, of great importance, demanding intelligence and skill, but it is a loss that craftsmen with a special gift for designing and making have to devote the best energy of their life to it. page 119... In his earlier work Mr. Channon adhered strictly to the grand Strad model, but latterly he has worked on a model of his own, the principal measurements of which are 13 63/64. 6 36/64, 4 16/64, 8 10/64, the three last fractions may, of course, be expressed in 32nds). The sound-holes are 3 inches, and the C’s 3 3/16 inch long. The thickness of the back is 3/16 diminishing to 1/8, and the table is 1/8 all over. The outline of this model is simple and graceful the curves of the C’s as they approach the corners being not quite so pronounced as in the Strad model, and the linear difference in the width across the upper and lower bouts is not so great as in the grand Strad. Viewed as a whole the outline is well balanced, and the curves easy and proportionate. The scroll and sound-holes are of Stradivarian character, beautifully designed and placed, and the corners are full without being obtrusive. There is a sense of gentle restraint about the model that is very pleasing to the trained eye. Violin makers, especially beginners, frequently break out into original models, and where the hand and the eye have not been severely trained, there is little control over the curves. To produce a perfect model (using the word model here to include outline and arching) due regard must be paid to five cardinal principles: unity, repose, symmetry, purity, moderation. Only he who is able to combine these five principles and to express them in forms can design a perfect violin model. Symmetry and moderation are often lacking in the corners of modern fiddles. There was much solidity and withal moderation and repose in the quaint and quiet corners of old Maggini. When Stradivari waked those corners of their slumber in his own work, he did all that pure art dare do. Many of his imitators have added two pairs of miniature winds to their instruments, and the result is grotesque. Mr Channon has not only succeeded in producing a beautiful model: he also produces a fine tone. After all, the tone is the chief thing, and all the skill and care lavished on the workmanship would be energy wasted if the tone did not come out rightly. Artists who use his instruments say that the tone is rich and mellow, easy to get, and equal on all the strings. The following facsimile is that of the label used by the maker while working in Plymouth: the word “London” being substituted for “Plymouth” in the one now used. Image of Channon's label, from page 120 of British Violin Makers... 1920. By the outbreak of WWI, Plymouth, Devonport and Stonehouse had amalgamated, the three towns became one. 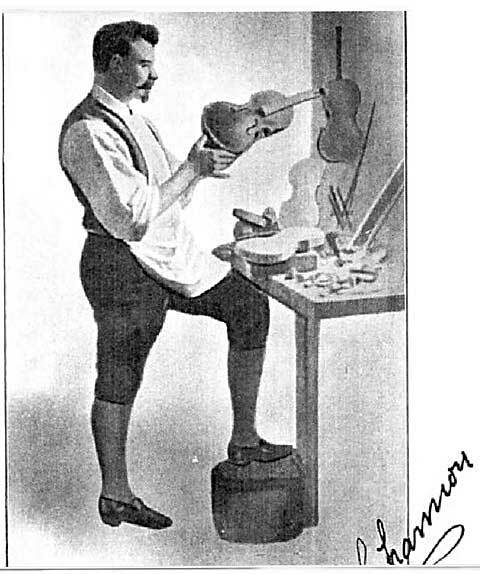 Channon was listed in the 1914 Directory of Plymouth, Stonehouse and Devonport as ... CHANNON Fredk William, Violin maker, 28 Tavistock place, Plymouth. That was the last time Channon was mentioned in any Plymouth or Devonport directory; he must have gone to London during the war period as he was there by 1920. Industrial Great Britain: A Commercial Review of Leading Firms Selected From Important Towns of England with Illustrations of England's Prominent Edifices. Historical, Statistical, Biographical. 1893. London Printing and Engraving Company, 53 & 54, Chancery Lane, London. Book: A Victorian business survey reviewing shops and premises, both large and small, operating in the provincial Britain of the late nineteenth century.